It's been a long time, folks! I have two babies graduating in two months...one from high school and one from college. Needless to say, things behind-the-scenes have been a little crazy. 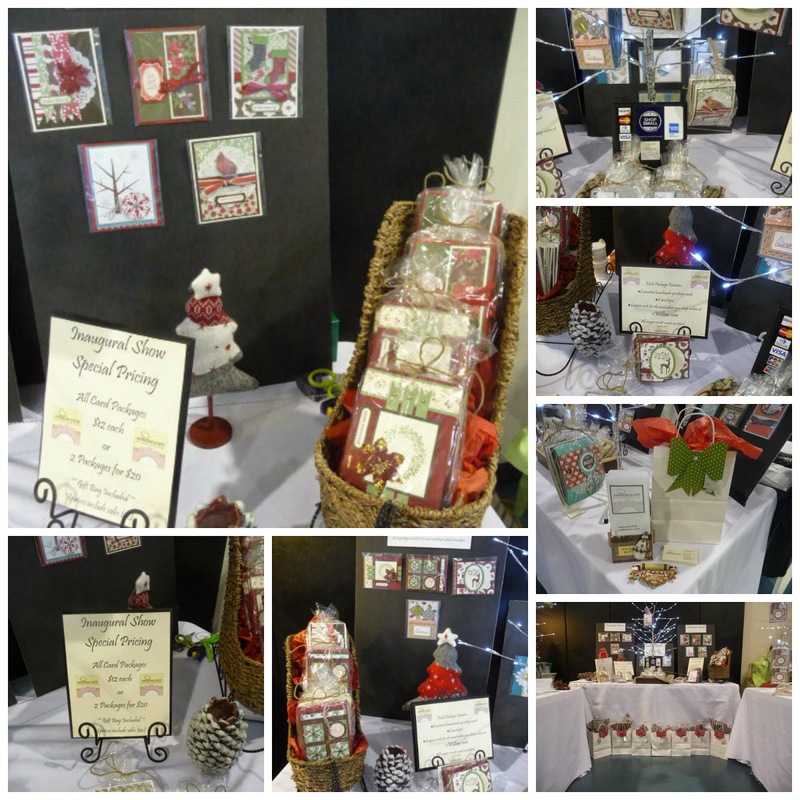 I participated in my first craft show in December. I made 800 cards in 6 weeks. I am glad that I did it, but I'm not sure if I am going to do it again. At this point, I really have nothing to lose by doing it...I already put out the capital to purchase the items for the booth. However, the organizers need to get with the program and realize that they need to use social media to promote the show. When I initially decided to participate, I did a lot of Googling to get ideas on how to display the cards. I had a list of "no-can-dos" in my head, along with a list of how I wanted the booth to look. to have my booth look like something out of a county fair. That's just not my style. Here is a look at the three tables I used. I had a 10' x 10' booth, so I set the tables in an upside-down "U" formation, leaving room on the upper sides for chairs and supplies. Each table had two 4' white trees with LED lights built into them, except for the back table, which only had one tree. I used the back table as the "Welcome" table. It is where I kept all of the signage and important info, like "We Accept All Major Credit Cards," info about placing online orders, business cards, etc. I sold my cards in packages of eight. I put each set of cards in a cello bag and tied the bag with hemp twine. 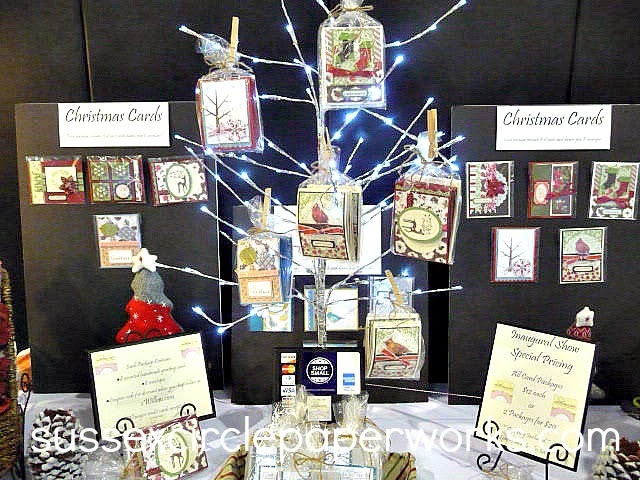 I used plain wooden clothespins to pin the packages to the trees. 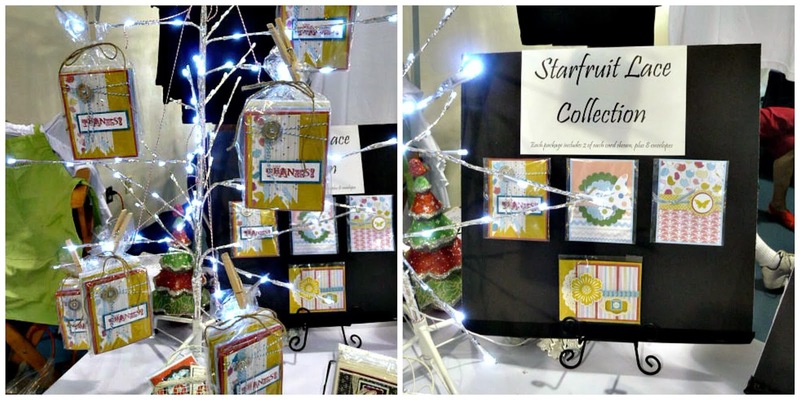 Next to each tree I placed a sign with a display of each card in the package. To take up table space, I put some single cards in baskets (which helped to increase sales) and added a little Christmas décor. Here is a close-up of a tree and the accompanying sign. 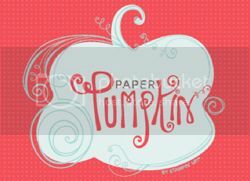 It really helped to have the signs so I could show each customer the cards in each pack. I was able to carry in and set up the entire display by myself, with the help of a dolly to haul in the heavy tables. The only help I needed was from my dad, who rigged all of the extension cords so that they could all fit into one outlet thingy. 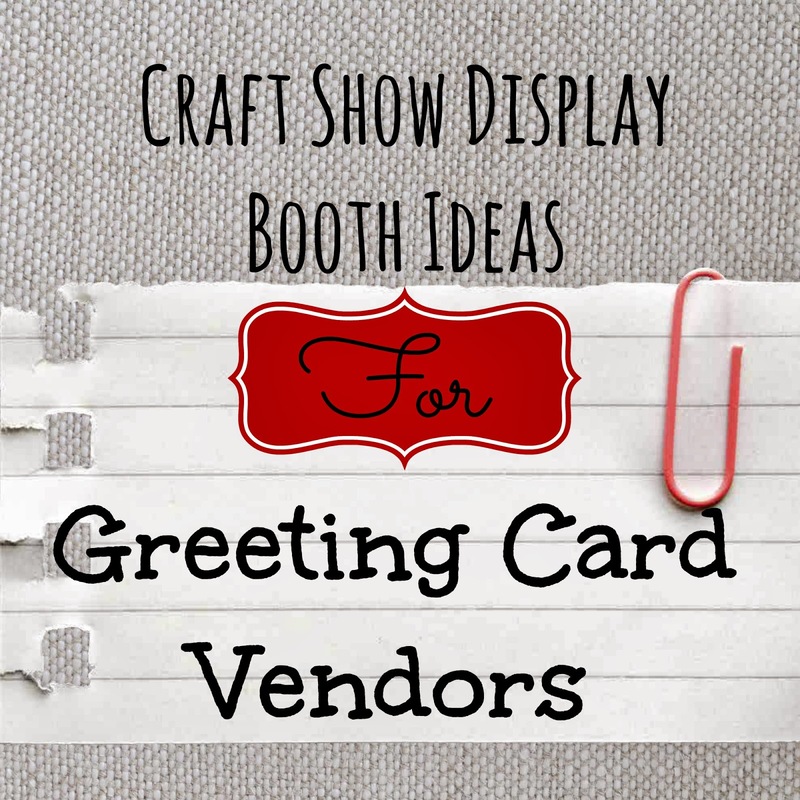 Do you have any interesting ways to display cards at craft shows? If so, leave a link to your photos in the comments section below.